Historically, Abbas has been the least popular among Fatah leaders – the likes of Abu Jihad, Abu Iyad, and Arafat, himself. These popular leaders were mostly assassinated, sidelined or died under mysterious circumstances. Arafat is widely believed to have been poisoned by Israel with the help of Palestinians, and Abbas has recently alleged that he knows who killed Arafat. Yet, despite his unpopularity, Abbas has remained in one top position or another. The power struggle between him and Arafat which culminated in 2003, until Arafat’s death in November 2004, hardly helped Abbas’ insipid reputation among Palestinians. However, his long-drawn-out speech of nearly three hours on November 30 brought nothing new; rehashed slogans, and subtle messages to the US and Israel that his ‘revolution’ shall remain subdued and non-violent. Considering this critical period in Palestine’s history, Abbas’ impractical rhetoric represents the depth of the crisis among Palestine’s political elites. The numerous rounds of applause that Abbas’ tedious, unimaginative speech received from the nearly 1,400 supporters who attended the conference is a reflection of the deep-seated political tribalism that now controls Fatah, the dominant PLO party and, arguably, the party that sparked the modern Palestinian revolution. But today’s party is a far cry from its original self. Fatah’s founders were young, vibrant, educated rebels. Their primary literature from 1959 spoke of their early influences, particularly the guerilla war of Algeria’s resistance against French colonialism. Certainly, some circumstances have inevitably changed, but many aspects of the conflict have remained the same: Israel’s territorial war, unceasing colonial expansion, backed by the United States’ unhinged imperialism. Yet, Fatah has changed to the point that its founders would no longer recognize the current political structure from what they had created. The movement is now more keenly interested in consolidating the power of Abbas’ allies than fighting Israel; top members are conspiring against each other, buying allegiances and ensuring whatever massive financial perks that resulted from Abbas’ Oslo accords remain intact, even after the old leader retires. Mohammed Dahlan’s political clan was, of course, excluded from the conference. In fact, the reason the conference was held after all these years (seven years have separated it from the last one) is partly to ensure the new Fatah hierarchy is set up in such a way in order to prevent Dahlan’s allies from staging a comeback. The sad truth is that, regardless of who wins in the current power struggle, Fatah’s descent is inexorable. Both Abbas and Dahlan are perceived as moderates by Israel, supported by the US, and extremely unpopular among most Palestinians. According to a poll conducted in September 2015, the majority of Palestinians – 65% – want Abbas to resign. The same poll indicated that Dahlan was nowhere near popular (only 6% supported him) and Abbas’ allies, Saeb Erekat and former prime minister, Salam Fayyad, received 4% and 3% of the vote respectively. The Fatah conference political theater on November 29 seemed far removed from this reality. After Abbas – who was only elected to lead the Palestinian Authority once in 2005 for a period of 4 years – purged all of his opponents, he sought a new mandate from his supporters. Predictably, “everyone voted yes,” a spokesman for Fatah, Mahmoud Abu al-Hija told reporters. When ‘everyone’ in Fatah’s top political circle votes for Abbas, while the majority of Palestinians reject him, this leads one to conclude that Fatah is neither a fair representation of the Palestinian people, nor is it remotely close to the pulse of the Palestinian street. 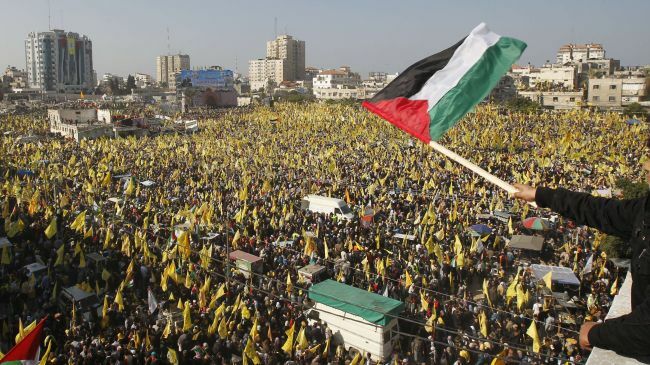 Even if one is to ignore the ‘yes-men’ of Fatah, one cannot ignore the fact that the current fight among the Palestinian elites is almost entirely detached from the fight against Israel. Palestinians are victims of daily violence: Jewish settlements are occupying Palestinian hills and are ever expanding, Israeli soldiers roam occupied Palestinian land, and Abbas, himself, is not allowed free movement without prior ‘security coordination’ with the Israeli army. Moreover, Palestinians are divided among factions, regions and clans; political favoritism, financial corruption and straight-out treason are eating the Palestinian body politic like an incurable cancer. Talk of ‘unity’, ‘reconciliation’ and ‘state building’ are just that – words – while Palestinians suffer their bitter existence under the boots of soldiers, behind checkpoints, and under the quiet – but maddening – humming of military drones. Palestinian struggle has been hijacked by power-mongers and capitalist elites who became the stooges if Israel and USA.